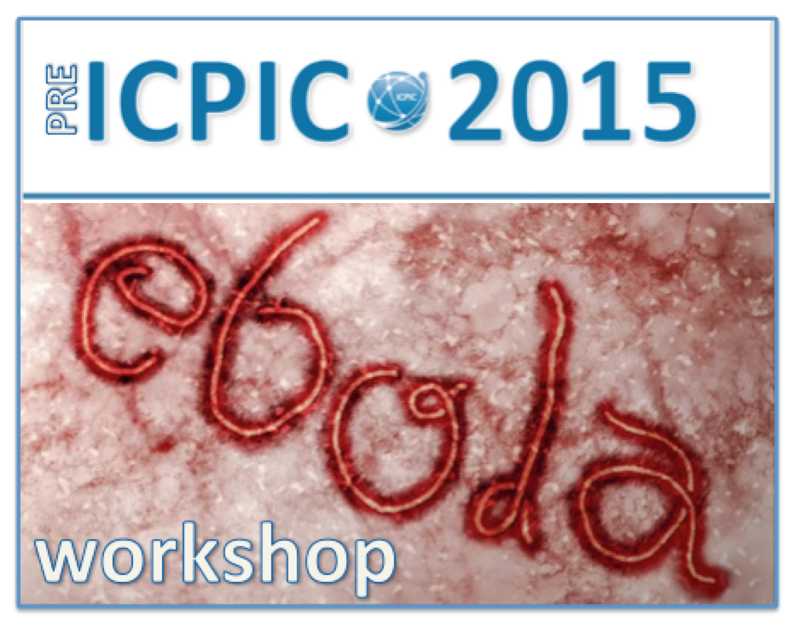 I gave a webinar yesterday on some of the infection prevention and control considerations related to Ebola. You can view the recording and download the slides here. Whilst preparing the webinar, it occurred to me that the real game changer in the outbreak that made the world take note was the three transmissions of Ebola in developed healthcare systems outside of West Africa. One occurred in Madrid, Spain in early October, and a further two occurred in Dallas, Texas, a few weeks later. Before these in-hospital transmissions, there was a general feeling that developed healthcare systems could handle Ebola safely. Clearly, that was not the case! Furthermore, the ratio of secondary transmissions for dealing with Ebola cases in developed healthcare systems isn’t great: of the 13 cases that have been cared for outside of West Africa, three secondary transmissions have occurred. The outbreak has thrown up some new challenges, outlined below. 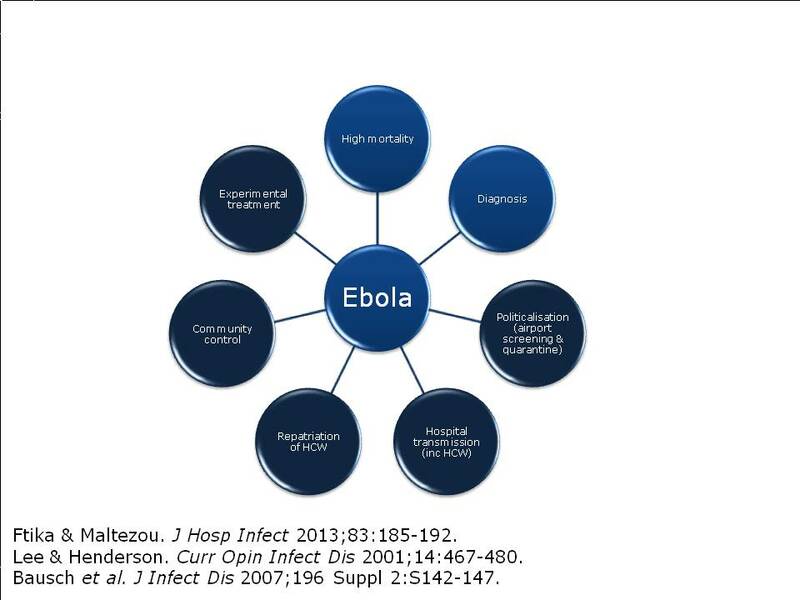 Figure: the emerging challenges of the Ebola outbreak (the dark shaded circles indicate the new and emerging challenges). One area of controversy is the appropriate protocols for terminal decontamination following a case of Ebola. Clearly, the most important risk in terms of transmission is direct contact with blood or body fluids from infected patients. However, despite being an enveloped virus, Ebola can surface on dry surfaces for days to weeks under some conditions in laboratory studies. Furthermore, transmission has been associated with indirect contact with contaminated environments. For example, in a recent report from the field, inadequate use of PPE for dealing with surfaces that were grossly contaminated with body fluids from confirmed cases was identified as one of the risk for acquisition. So, we need to make sure that contaminated surfaces are dealt with appropriately, and most hospitals that have dealt with cases outside of West Africa have used hydrogen peroxide vapour for terminal decontamination. There is a suggestion today that the epi curve may be peaking in Liberia, which is the epicenter of the outbreak in West Africa. Even if that is the case, we can still expect to see more repatriations to developed healthcare systems and perhaps more cases showing up at our hospitals. So, we need to make sure we do everything in our power to prevent secondary in-hospital transmissions. 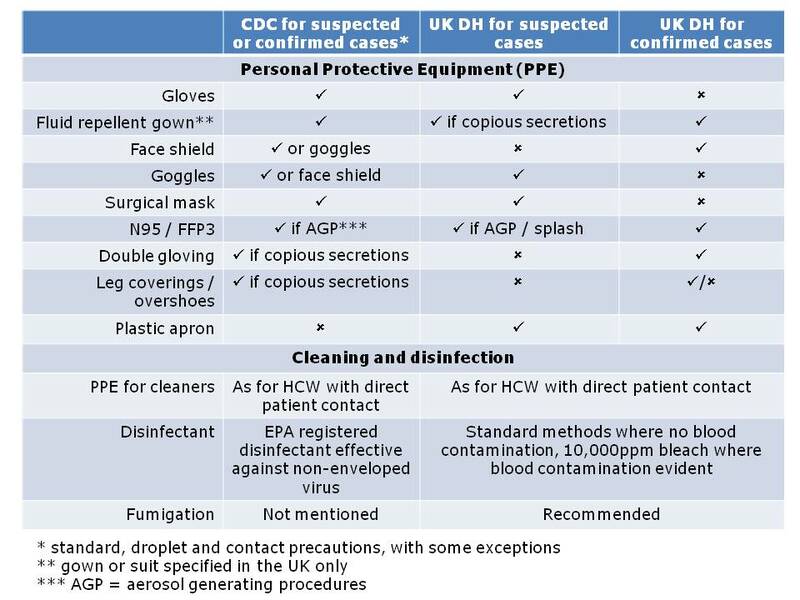 So is there any reason why the level of PPE and type of terminal disinfection required should be any different depending on which side of the Atlantic you happen to be? None whatsoever. So why the discrepancy? It’s difficult to say. This difference in recommendations has prompted the question of “To CDC or not to CDC” in terms of PPE for Ebola, and an opinion piece in Annals of Internal Medicine justifying the CDC approach. It is probably true that the level of PPE recommended by CDC is enough to block transmission, and that the risk of environmental contamination is low enough such that fumigation is not necessary. Probably. But is that good enough when Ebola is on the line? It is certainly true that you can be wearing all the PPE in the world but if you put in on incorrectly, don’t take care of it during use or remove it carelessly you will put yourself at risk. 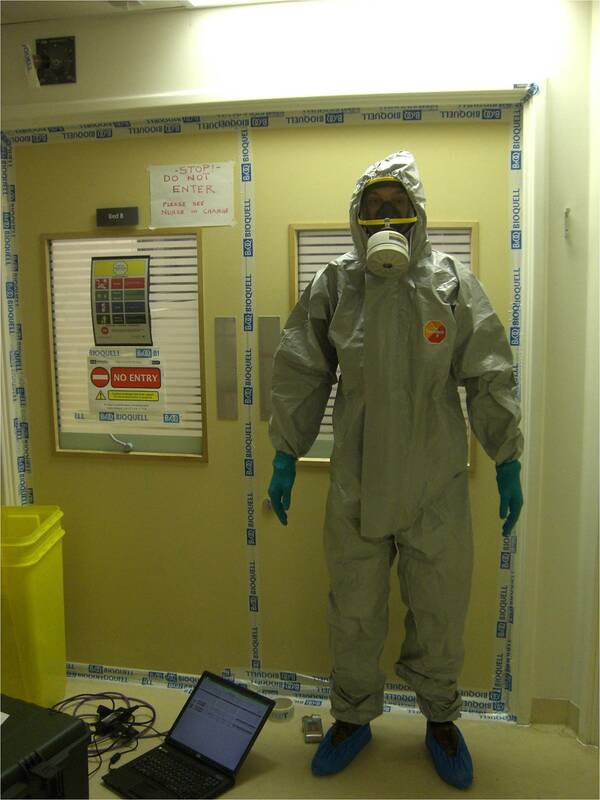 When I came to decontaminate a room using hydrogen peroxide vapour following a case of Lassa fever in London some years ago, I wore all the PPE that I could lay my hands on (see below)! Me illustrating the “belt and braces” (aka paranoid) approach to PPE (a la UK, not CDC recommendations). 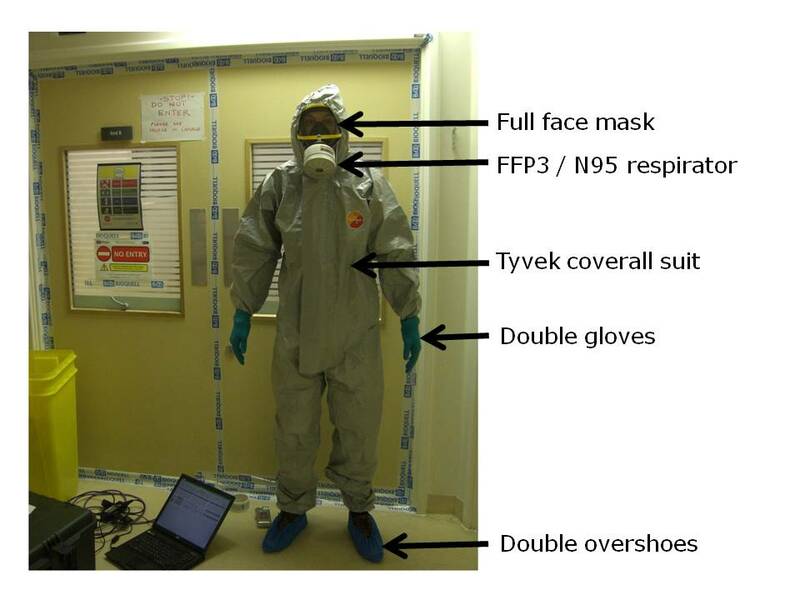 Did this level of PPE match the risk of exposure to viable Ebola? Perhaps not, but it certainly made me feel a whole lot more secure about entering the room to do the job! As the outbreak of Ebola continues unabated in Sierra Leone and Liberia (1323 cases and 729 deaths as of July 27), I thought it would be an opportune moment to share a close shave that I had with the closely related Lassa viral haemorrhagic fever (VHF) virus in 2009. A patient was transferred from Mali to a London hospital with a diagnosis of malaria. The case was initially thought to represent a low risk of VHF (to be fair, Lassa had never been reported in Mali, and the patient came with a diagnosis of malaria). This led to the potential exposure of 123 healthcare workers and visitors, and a busy week for the infection prevention and control team to follow each of these individuals. The useful risk assessment now available from Public Health England may have helped to reduce the number of people exposed. The patient died in a negative pressure ICU room on the day of admission. At that time, there were no clear recommendations about how to decontaminate the room, so I was involved in developing a decontamination plan with the hospital. Due to the rarity of VHF in the UK, the plan took a week to be authorized by the Health and Safety Executive. This meant that by the time it came to decontaminating the room, the bags of blood-soaked clinical waste, spots of blood on the bed, and used consumables on the floor had been festering for a week. Not ideal. Our decontamination plan included the use of hydrogen peroxide vapour (HPV) for terminal room disinfection due to the risk that VHF viruses can survive when protected by blood for several weeks on surfaces. This is borne out by some sampling during an outbreak that found intact RNA from the Ebola virus on blood contaminated fomites (although not on fomites that were not contaminated with blood). It’s reassuring that the Department of Health / Health and Safety Executive guidelines published a few years after this case also recommend the use of fumigation for terminal decontamination of hospital rooms. There is legitimate concern that we may see cases of Ebola in the UK and USA in this globalized, interconnected world. If so, then we need to be prepared, and some have questioned our state of readiness. We are fortunate to have comprehensive guidelines from the Department of Health / Health and Safety Executive, including clear guidance on how to decontaminate a room following a case of VHF. My close shave with VHF has given me a great deal of respect and, frankly, veneration for the brave healthcare workers who are risking their lives on the front line in bringing the current outbreak of Ebola under control. Photo: Ebola courtesy of Phil Moyer and CDC/Cynthia Goldsmith.